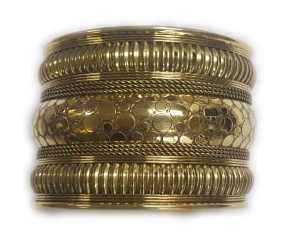 This exotic patterned arm cuff bracelet is great for any style of belly dance... or wear with jeans! Made in India. This high-quality, imported arm cuff bracelet is a wonderful piece for any style of belly dance - from Cabaret to Tribal and Tribal Fusion. It's also a great way to add exotic flavor to your casual or evening wear.